Approaching the House of Mary Shrine from Hwy. 52 you will find the Chapel of St. Joseph, a Rosary Pond, the Little House of Mary, and the Mary Entrance. 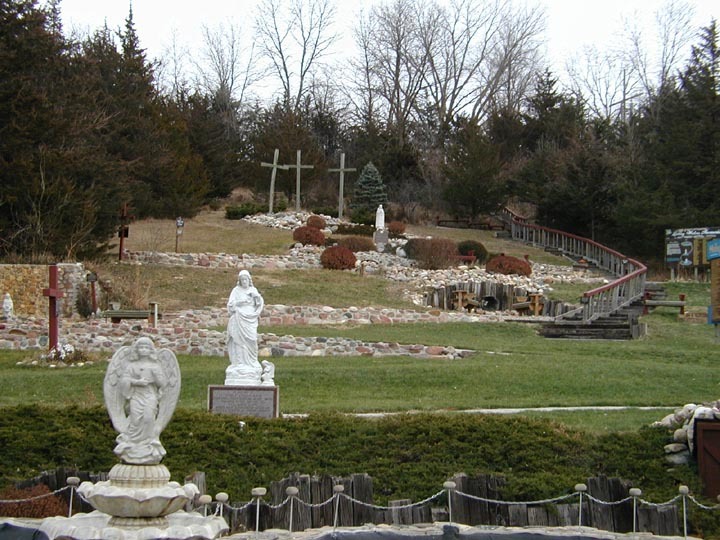 You then begin the ascent with statuettes, fountains, the Way of the Cross, and, at last, the three giant crosses overlooking Lewis and Clark Lake. The descent leads to the tomb, Moses with the Ten Commandments, and St. Michael. The House of Mary greets you at the ground level, and across the road the Holy Innocents Garden and the Way of the Saints welcome you. Visit their website for the gift shop, mass, rosary, and meditation hours.